At the beginning of January, 2015, I completed a 5 Day Silent, Directed Retreat at Campion Retreat Center in Weston, MA. It was a wonderful experience that drew me to deepen my relationship with Jesus. I was directed during this time by Fr. Bill Barry, SJ through portions of the Ignatian Spiritual Exercises to uncover "what makes Jesus tick". 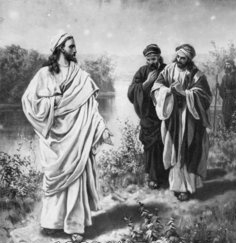 In this time of praying the New Testament with Jesus I found a way of encountering him in scripture that fulfilled what became the inspiration of my retreat: "If you want to follow me, you should get to know me." My retreat experience inspires me to continue the process I began at Campion for a sustained period of time. I intend to prayerfully spend time with Jesus in the 3 Synoptic Gospels (Matthew, Mark, Luke) and The Gospel of John with the additional sources listed below and reflect on this here. How did Jesus look at his own Faith tradition (Judiasm) and how does that inform me to look at my own Tradition? What did Jesus' actually teach and how did he exemplify who he was through his life? Who was Jesus and what does his relationship to God he knew as Abba tell me about him? In addition to the New American Bible and the New Jerusalem Bible, I look to the following cross section of biblical scholars (Matera and Wright), learned modern contemplatives (Borgeault, Merton and Rohr) and spiritual writers (Marion, Martin and Nolan) to aid my prayerful encounter with Jesus. I am seeking to verify and deepen my own insights by comparing mine against theirs as I encounter Jesus through the different points of view expressed by the four Evangelists in the Canonical Gospels. Borgeault, Cynthia. The Wisdom Jesus. Shambala, 2008. Marion, James. Putting On the Mind Of Christ. Hampton Roads, 2011. Martin, SJ, James. Jesus - A Pilgrimage. HarperOne, 2014. Matera, Frank J. Resurrection, The Origin and Goal of the Christian Life. Liturgical Press, 2015. —. The Sermon on the Mount, The Perfect Measure of the Christian Life Liturgical Press, 2013. Merton, Thomas. The New Man. Farrar, Strauss and Giroux, 1961. Nolan, Albert. Jesus Today - A Spirituality of Radical Freedom. Orbis, 2011. Rohr, OFM, Richard. Things Hidden: Scripture as Spirituality. St. Anthony Messenger Press, 2007. —. YES, AND ... Daily Meditations. Franciscian Media, 2013. Wright, Nicholas Thomas. John for Everyone. Westminster John Knox Press, 2004. —. Luke for Everyone. Westminster John Knox Press, 2004. —. Mark for Everyone. Westminster John Knox Press, 2004. —. Matthew for Everyone. Westminster John Knox Press, 2004.